Another unique London Lunch Venue offering breath-taking view of the River Thames. It can be hard to find alternative ways to enjoy lunch in London. 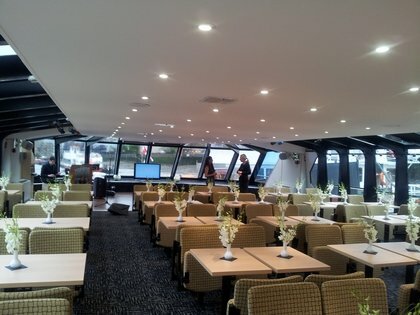 Why not enjoy your lunch whilst aboard our impressive vessel cruising up and down the Thames river. Our vessel leaves the moorings at Tower Pier and ventures off on a relaxing and calm journey while you enjoy a carefully picked and delicious two course lunch. The water bound journey will take you through the heart of London. Whether you want a cold beer or a glass of wine to accompany your meal, we have a fully stocked bar onboard ready to tempt you to a cold one when cruising up the Thames. We have taste bud tantalising main courses and delicate deserts that will get you taking pictures and bring your friends back to try more. We have a large open deck area for you to walk off your food and capture the right angle to enjoy the sites London has to offer. Cruising by London at a leisurely pace is the perfect speed to travel at when indulging in our incredible 2 course menu. With something to tempt your palette, our food and drink is bought to you with great service standards and all our onboard members of staff are happy to help where they can. Combining everything together makes for the most enjoyable 2 course Lunch River Thames Cruise Experience available. Boarding takes place from the Tower Pier – Beside the Tower of London with the Tower Bridge in its background.